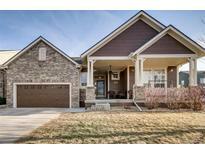 Below you can view all the homes for sale in the Murphy Creek subdivision located in Aurora Colorado. Listings in Murphy Creek are updated daily from data we receive from the Denver multiple listing service. To learn more about any of these homes or to receive custom notifications when a new property is listed for sale in Murphy Creek, give us a call at 720-580-6694. This home is meticulously cared for with no detail left undone. Oversized side load garage. MLS#5922277. FRONT RANGE REALTY LLC. Home comes with a 30-day buyback guarantee. Terms and conditions apply. MLS#4001639. Opendoor Brokerage LLC. The finished basement has 4 egress windows with option to build in a separate door for the basement entrance, wet bar, and cook top, microwave, refrigerator, and washer/dryer. Must see finished basement details! ! MLS#6372265. Delgado Real Estate. Additional benefits of this wonderful community included a community pool and clubhouse and easy access to Buckley AFB, DIA, Southlands, E-470, and I-70. Must be seen! MLS#9408020. Redfin Corporation. Come see this amazing home before it's too late. MLS#3220196. INTEGRITY REAL ESTATE GROUP. Located within walking distance of the clubhouse, tennis courts, and community pool along with several association parks that include playgrounds and a gazebo. MLS#6216571. Keller Williams DTC. Easy access to DIA, Buckley Airforce Base, E 470 & Southlands Mall. MLS#2537351. eXp Realty, LLC. The property includes a security and speaker systems, ceiling fans, and upgraded lighting. Quick Possession. MLS#7505175. Little Haven Realty LLC. Easy commute to DIA, Downtown, or Buckley AFB! MLS#9013657. Redfin Corporation. Open House Sunday 12 -2 Come See Us MLS#9540805. Brokers Guild-Cherry Creek Ltd..
Easy one floor, detached single family living at a price of the average town home! MLS#4617321. Weichert Realtors Professionals. New Paint , Open Floor Plan Ranch ,New Oven , Tile Floor East Keep Clean , Five Piece Bath , MLS#3138120. ALL PRO REALTY INC.
Large bedrooms with two having full baths. Quick possession! MLS#3005024. Altitude Property Group. Pride of ownership is evident. https://tours.virtuance.com/public/vtour/display/1229718#!/ MLS#3473727. Keller Williams Real Estate LLC. Also hardwired for security and wifi MLS#2769916. Windermere Metro Denver Real Estate. The 2.5-car attached garage provides plenty of room for even more storage, a work space, & two cars! MLS#4755549. Keller Williams Integrity Real Estate LLC. The price per sq ft is beckoning you to come and see this well-maintained retreat that can truly become all yours! See the Tour: https://tours.virtuance.com/1224995 MLS#4029139. HomeSmart Cherry Creek. Artfully presented for the discriminating buyer. MLS#5558804. Laine Jones & Co.. Beautifully upgraded kitchen with quartz counter tops & gas stove with breakfast bar. Pet free home. MLS#4824319. Steps Real Estate 104.